Hi. I'm mgdavis. I'm not a great writer, and I don't have much of a way with words. This blog is mostly for myself, I don't expect to garner much of a fan-base. Feel free to browse the postings, agree with me, disagree with me, offer hints and tips, facts and opinion. I'll try to keep things interesting, so drop in once in a while if you're bored. i just put lots of pics on my blog to do most of the talking. you know what they say... a picture is worth a thousand words. A bit more about myself. I'm 21. Caucasian male. Tall, thin. I've dreamed about riding all my life. My Dad used to ride, I'd see snapshots of him and his bike in Yellowstone Nat'l Park, I used to play with the '69 Trail 90 that was under a tarp in the backyard. He didn't ride for several years when I was young, raising a family left little money for it. When I was fourteen or fifteen he got a '77 GL1000 Goldwing from my Uncle. The bike had sat for several years in a driveway in California, and needed a carb rebuild before it would run. It never did run perfectly, but it would get ridden occasionally, and on a couple occasions a 15 year old me got to take the behemoth to a professional center parking lot across our suburban street and ride in circles and big figure eights. Looking back I'm somewhat surprised I didn't manage to drop the six hundred pound bike on myself, if it had started tipping, I wouldn't have been able to do much but get out of the way. If I was interested in riding before, that Goldwing truly set the hook, I've wanted a bike badly ever since. I also grew to love the old Universal Japanese Motorcycle look, although I hated the large aftermarket fairing that had come on the 'Wing. Fast forward to 2006. On July 10th of 2006 I bought my first bike. 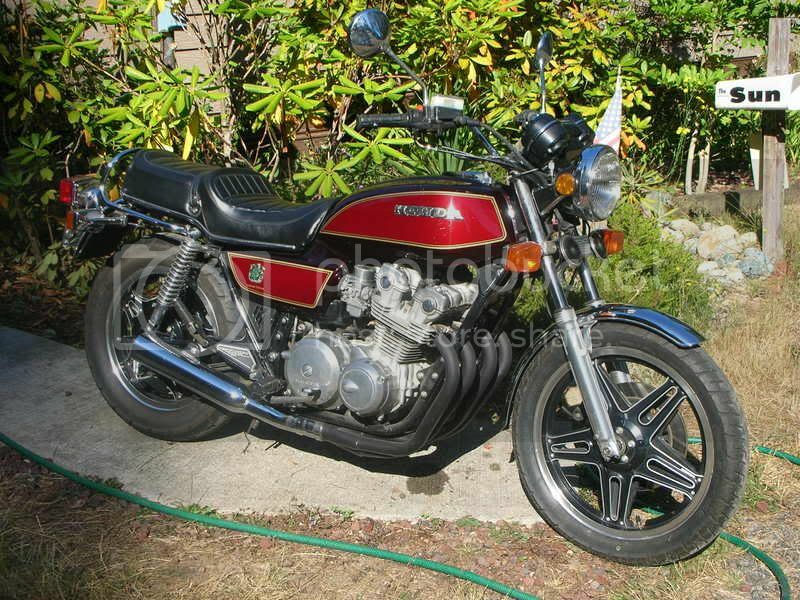 It is a 1979 Honda CB750K 10th Anniversary Limited Edition. It looks much like my Dads old Goldwing, even the paint is similar. It is a simple, classic peice of UJM, right down to the big, unfaired headlight. It is in cosmetically good shape for a 27 year old machine, with only a few scratches in the paint, and a little dent in the tank. However, it sat for several years, and needs work to get going again. I currently have the carbs out, and am waiting on gasket sets to get them reconditioned and back in the bike. I hope it will be that simple. Once I get it running it needs a couple electical gremlins run down, then it should be good to go. Verm; more signal, less noise. Hmmm....Safety Gear...I got mine before I got my bike because I knew if I bought the bike first, all my money would go there and I would be tempted to ride with mediocre gear. Thus far I have helmet, jacket, and gloves. I bought an HJC AC-12 lid in grey. It is very snug, I haven't ridden yet, so I haven't had a chance to break it in. My jacket is a Fieldsheer, I'm not quite sure which model. It could be a Sprint. It is very basic, black, liner, handwarmer pockets, etc. It only cost about $110, I had planned to get a nicer one but spent more than anticipated on my helmet. I can't recall what make my gauntlets are. They were $28 or so, and have carbon-look knuckle guards and air scoops on the fingers. Down the line I want to get Alpinestar gloves. I do have boots to wear, although they are just the issue combat boots I got in basic training. They will suffice until I have more spare money laying around. I need to get riding pants, something that is a little more abrasion resistant than my Carharts. I'll let that go for the meantime, I need to get my bike running and obtain my endorsement before I can justify spending more money on riding gear. mgdavis wrote: Verm; more signal, less noise. I'm feeling uninspired, so here's a link to a friends website. Hes' got a pretty awesome one-of-a-kind 4x4, and he has documented the building of said truck here. Lots of pictures, and a video. I'm getting tired of waiting for my parts to come in. The dealer said 5-7 days, and it has been 7 business days now with no call. How hard can it be to ship a gasket set and some screws? I'd appreciate at least a call to let me know if the parts are backordered, in transit, or whatever. I want to put my bike back together so I can ride. Procreating sons of questionable ancestry. Still waiting on a call for my parts. I'll have to drop by tomorrow and see what's going on. I hope it's not going to turn into a "we don't make those anymore" kinda deal. I want new parts, not junkyard parts. All my parts came in. I found out the float bowl gaskets they ordered were for the wrong year. The correct gaskets were waiting to go on a ship in Japan or something, they were three weeks out. I decided to order the rebuild kits, as they contained all the right parts and are only 5-7 days out. More waiting. I got my carb rebuild kits today. Picked up my headlight that's been sitting at the dealer too. Next week I might get enough time to put the carbs back together and maybe get the carbs back in the bike. My buddy just got a 1997 Virago 1100, and I'm itching to get riding. The rebuilt carbs went into the bike yesterday. It started right up, I surprised myself. This morning I went down to the DOL and got my permit. I've put forty miles on it so far. Things to check out - bags, bigger gloves, windscreen, earplugs, pump that fits on rear tires valve stem. My back is killing me from wearing my Maxpedition Fatboy Jumbo with my normal pocket contents. I might need to work on my posture too. The bike seems to run well, although 4800 rpm at 60 mph seems high to me. I guess I just need to get used to it. That means I might also have to run a lower gear around town (2500 rpms to low?). I also need to remember my kill switch is not spring loaded . I have had problems getting it started twice because of that. Saturday I need to get the oil and brake fluid changed. The oil is dark, it's been sitting in the bike for at least five years. The brake fluid is dark too, definitely needs to be flushed and changed. One of the fork seals needs replacing I think, it's weeping a bit of fluid. The transmission is making noise, I'm hoping the oil change will settle that down. This morning when I while the engine was warming I noticed some smoke coming from the crankcase(?). It looks like there is a small oil leak there, a bit of oil and grime on the engine. I decided to wear earplugs this morning, the aftermarket exhaust is a little noisy. I'm still getting used to how high the engine revs. I don't think I've taken it past 5500 rpms, and it redlines at 9500. It screams just going down the freeway at 60 mph. I love the acceleration. It's like nothing I've driven before. My F150 has a sraight-six and a five-speed, and I'm lucky if I can hit sixty by the end of the on-ramp. My bike feels like a rocket, the acceleration actually shoves me toward the back of the seat. Once I get the oil changed and get more comforable with the revs I'll no doubt be accelerating even faster. I've not gone faster than 70 yet, I don't need the topend speed, I'm plenty happy with crusing down the curvy beach road at 25 or 30. I changed my oil and filter last Saturday. I've been puting miles on the bike. I scheduled my rider course yesterday, they didn't have an opening until the first weekend in November. I don't like the noise my transmission makes in neutral, especially when the engine is cold. I hope it's just me being paranoid, I tend to do that with noises. When the weather starts getting nasty I want to take the bike in to the local mechanic, have him give it a tune-up, synch the carbs, whatever else needs to be done. I have notice a few places where gaskets have deteriorated and are seeping oil. I'll have to keep an eye on those. Yesterday I did a partial wash, knocked dust off the wheels, and polished the fenders and headlight bucket. I would have done a wash-and-wax, but the bike was sitting in the direct sun. I'll get it done next week before it starts raining. My coworker dumped his bike the other day. He claims he got rearended, which spun him out (a hit and run). I'm not sure I believe that, it was a forty mph road and he says he had just pulled out, and was going slow. He didn't call the cops because he doesn't have an endorsement or permit. His bike is messed up, I guess he broke off a peg or both pegs. His handle bars are also jacked up. He just got the bike a couple months ago, paid eight grand for a used '06 Ninga 636 that had already been laid down once. So, now he's about seven grand in the hole for a bike that's not rideable. I think he was trying to do a stunt and put it down. He likes to do wheelies and stuff. Idjit. Been commuting to work most days. It's getting cold in the mornings. I need to get warmer gloves, pants, and a thicker thermal shirt. I've noticed that the wind penetrates my jacket zipper at about gut-level. Dunno what I can do to alleviate that. I need to change my oil again, make sure all the sludge from sitting so long gets flushed out. Do that tuesday or wednesday maybe. I still need to get my brake line flushed too, the fluid in the reservoir is a nasty brown color. My visor was fogging pretty bad this morning. The weather was cool and humid, overcast. I've got an HJC AC-12. I tried cracking the visor open to the first notch, just 3/8ths of an inch or so. That seemed to cure the fogging. The extra airflow didn't bother me, it caught my forehead, not my eyes. I wish I had a garage to put my bike in. I was taking the cover this morning and a spider crawled out by my hand. I hate spiders. There was also a little white egg sack(?) on the cover that I flicked off with the tip of my knife. I hate spiders. I've put just shy of six hundred miles on the bike now. I've been getting right around 40mpg, that's a nice break from buying gas for my truck. If fuel prices stay high, the bike might pay for itself in a couple years. This morning on the ride to work I managed to accidentally lock up my rear tire. The ground was wet this morning on the side streets. I was downshifting to slow and turn onto an on-ramp. I thought I was in third, and went to shift into second. I realized that I had already been in second when my tire skidded and fishtailed for a few feet upon the shift to first. I rode it out and continued on my way. I need to change oil, and check my plugs and air filter. The bike has started stuttering while accelerating if it hasn't warmed up. I think it could be running rich due to a dirty air filter. Does this sound logical to anyone? The carbs still need to be tuned, I haven't touched them since the rebuild. Next day I get off I'll change the oil, filter, and air filter, and I'll pull the plugs. This morning when I rode in I tried a new trick to keep my hands warm. I took a pair of nitrile gloves (thin, like latex ones) and wore them under my summer-weight gloves to cut the wind. Sort of and adaptation of the dishwasher gloves trick. It seemed to help a bit, though the real test will be riding home tonight. Hey mgdavis! Good to see you Great bike! Looks like you had to wait a while for parts. That's so nerve racking. Though glad to see things finally came around. That was a great link to your buddy's dodge-zilla. I miss my Chevy I had to sell before we PCSed out here Hey, why'd he go with a V8 and not diesel? Don't tell me weight was a consideration, he's got 2.5t axles that use hydraulic steering! 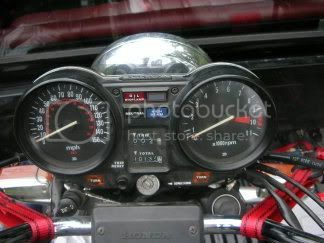 mgdavis wrote: The bike has started stuttering while accelerating if it hasn't warmed up. That's normal. The CB750K was (like many other CB750 versions) considered very cold blooded. If it's not fully warmed up, it'll cough and jerk when you get on it. Feel lucky that you have an early model. This behavior got worse with tighter emission controls on later models. The problem is that the carbs are set to run as lean as possible in order to make an emissions test look good. I sometimes have to choke mine in the middle of the summer to get it to warm up, and I live in a flaming desert.